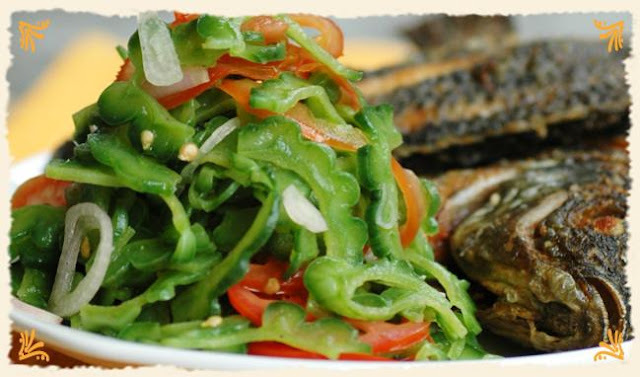 This healthy relish, pairs superbly with fried fish, lechon kawali or other sinfully fat filled partners. 1. Cut ampalaya into two, lengthwise. Remove the seeds. Slice thinly crosswise. 2. Rub ampalaya slices with salt. 3. Leave for 20 minutes. Squeeze out ampalaya juice. Remove excess salt with water. Squeeze out water. 4. Cut shallots and tomatoes into thin, round slices. Chill the vegetables slices. 5. For the dressing, in a small saucepan, mix Mama Sita's Coconut Nectar Vinegar and water and let it boil for 2 minutes. 6. Lower the heat. Add sugar and black pepper. 8. Arrange in a platter and serve with dressing.